As such, it’s free to go inside and when you do, there are stuffed animals everywhere! We were far more interested in the building itself though and there are some areas like the main hall which have been restored to look how they would in the time when the Willoughby family lived here. There is also an introductory audio visual film which gives some of the history of the hall. This place is an absolute gem, and it felt like the city council didn’t known what it had got. We wanted the whole place to be laid out as a country house or perhaps even Wayne Manor! It seems such a waste that so much of it is a museum which could have been housed in any building. We would also have liked to see more of the hall’s rooms. Nevertheless, it’s a lovely place to visit and the Batman connection will surely bring many more visitors. The Batman movie “The Dark Knight Rises” was filmed here in the summer of 2011. Filming took place over 2 weeks, mainly at night for the garden party scene with hundreds of extras who were sworn to secrecy. A number of daylight scenes were filmed for the movie too. At the time, the people of Nottingham did some star-spotting with Anne Hathaway, Christian Bale, Morgan Freeman, Gary Oldman and Michael Caine all being seen around the city. 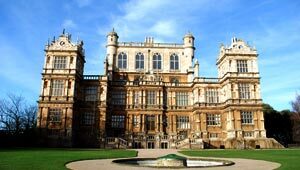 Wollaton Hall was chosen as Wayne Manor because it resembles Mentmore Towers in Buckinghamshire in the UK which was used in the first Chistopher Nolan film, “Batman Begins”. In that movie, the plot saw the house destroyed by fire and Bruce Wayne then pledged to re-build the family mansion. When you visit the hall, make sure you spend some time in the huge park. You don’t realise just how big the grounds are until you start to walk around them. There’s also a café located within the stable block and the Nottingham Industrial Museum is based here too. Getting to Wollaton Hall & Park will require a bus or taxi journey from Nottingham city centre. Wollaton Hall is open daily from 11am to 5pm (April to October) and 11am to 4pm (November to March). Admission to the hall and park is free but a car parking charge of £2 for 3 hours or £4 per day applies. Wollaton Hall is 3 miles to the west of the city centre and can be found by following the brown signs from the A52 or the A6514. From the M1 take junction 25 and follow the signs. The postcode for your sat nav is NG8 2AE. A number of buses serve Wollaton Hall, for more information please call 0115 950 6070 or visit Traveline Eastmidlands.